After our Saturday evening in Toronto for a show with Steel Rail and Over The Moon, our travels took us to The Registry Theatre in Kitchener on Sunday afternoon, for a matinee show with Trent Severn. 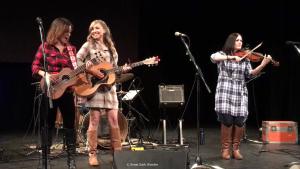 Indeed, the concept of a matinee seemed quite novel, but what better way to spend a couple of hours than in the company of our good friends Emm Gryner, Dayna Manning and Lindsay Schindler. The early start/finish also gave us further options for more live music later that evening back in Toronto. But for now, we were excited to see this trio once again and enjoy their wonderful brand of Canadiana. Finding some great seats up front, Trent Severn (along with their friend and “drummer extraordinaire” Stephan Sczcesniak) were introduced to the stage by no other than Keelan Purchase (Mr Newfoundman himself, and very recent ‘new’ Stratford, ON resident). And spotting the two of us immediately, Team GDW were welcomed to the show by Dayna Manning – thanks Dayna, always our pleasure to attend a Trent Severn show. With two sets of music, Trent Severn would perform 15 tracks, and receive more than enough applause to earn one bonus encore number to ultimately close the show. 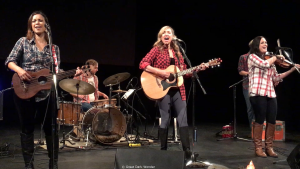 We last saw Trent Severn back in November, when songs like “Snowy Soul,” “Nil Visibility” and “O Snow” offered reminders of the onset of winter. And while there was little deviation from the set list this time around, these same tracks were free of those wintry thoughts. Summer is almost here, so it was “Sweethearts,”, “Charlie Lake” and “Take Me Back” that had the extra oomph to prepare you for time outdoors, long nights and good times ahead. With three full length albums in their repertoire, there was no shortage of material to call upon, mixing new and old with ease, and providing a seemingly endless supply of Canada-focused music. Indeed, Emm would recall a visit to a local Esso gas station, and a casual conversation with an attendant who offered that in Canada, it’s either ‘frostbite’ or ‘fly bites’; two phrases that became integral to the chorus for “Goodbye Sadness.” Drawing upon other truly Canadian inspirations, from the legend of Bill Lishman, who taught geese to migrate (“From Canada”), to the great maple syrup heist in Quebec (“Stealin’ Syrup”), Trent Severn’s creative ability to fuse actual Canadian history within the context of their original compositions is a trait that truly sets them apart from their contemporaries within this genre. Pausing midway through their first set for their “Plaid Runway” segment, the audience were invited to have a dance-off (complete with supplied plaid shirts and Hudson Bay merchandise) for some bragging rights and a box of well-known sugary treats. Piloting this segment during that November show, Dayna reminded us that we shared that evening with them, and recalled that the solo dancer (a very young girl) wound up the recipient of 50 Timbits. For this Sunday afternoon, several members of the audience chose to join in the fun, and a slightly smaller box of Timbits (strategically planned to prevent the ire of parents everywhere) was awarded to another young lady, whose perfectly timed ‘splits’ made her the unanimous choice. 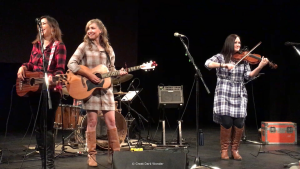 All three ladies would share tales with the audience, along with anecdotes, jokes, and some banter amongst themselves (“I think I can hold a note longer than you,” Emm challenged Dayna after some shared harmonies. “Oh really,” was Dayna’s response, “Noted!”). As if accepting the challenge, Dayna would give her vocal chords a true workout during “Save Me” (always a delight to experience live, although one day I will hopefully get to hear them perform “Haliburton High” too for the same reasons). 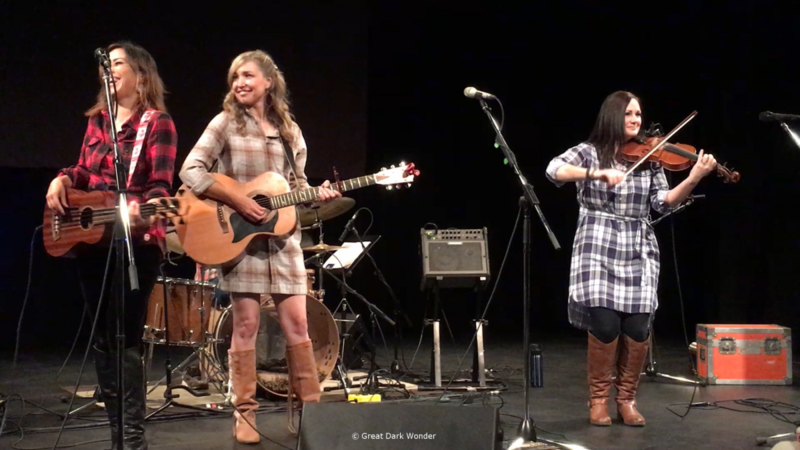 And during Lindsay’s excellent violin pieces during “Sweethearts,” Emm would attempt to encourage Dayna to rock and sway with their guitars in true rock fashion, except the miscue of which direction had them sharing comical grins at how easily they failed. Those in attendance reaped all of the rewards on this particular afternoon. 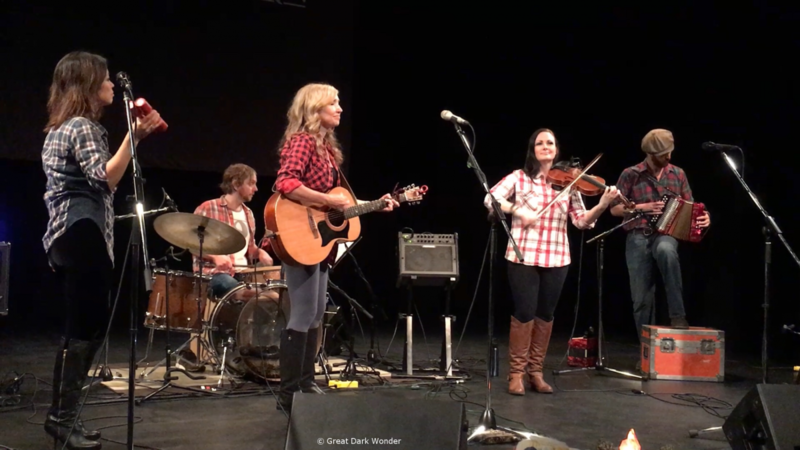 Midway through the second set, Dayna would invite Keelan to join them on stage, and as an incredibly gifted accordion player in his own right, simply dazzled during “O Snow” to add a previously unheard live element to this haunting number. Trent Severn would also offer Keelan some time to perform traditional music from Newfoundland, and accompanied his stellar accordion work with their own musical skills. This was definitely one of the highlights of the afternoon. Heading down the home stretch, all five artists on stage would ramp things up with the audience participation number “Eh Canada” and the crowd favorite “Stealin’ Syrup” to end the show. Returning after a very brief exit, those wonderful three-part harmonies would be shared one last time during “Freedom,” a fitting end to a fantastic Sunday afternoon of live music from these multi-talented ladies (and their two musical guests).